KIEV, Ukraine -- Anna Andriyevskaya cannot go home. If she does, she will be arrested for inciting separatism and face a jail term of five years. 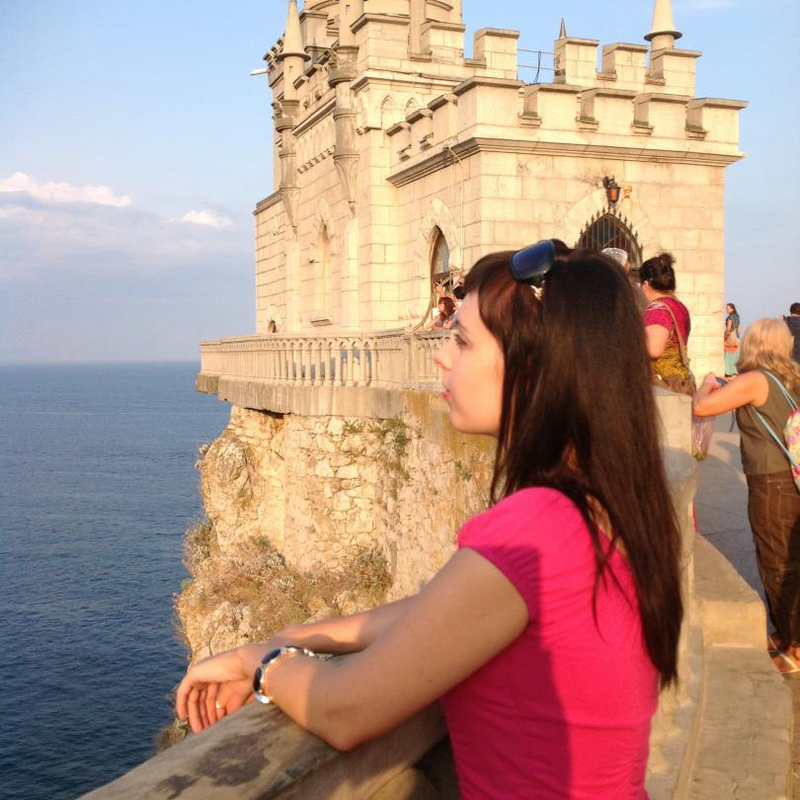 Journalist Anna Andriyevskaya stands close to the Swallow’s Nest castle in Gaspra, Crimea. Andriyevskaya lived under the Russian occupation of the region for three months before moving to the Ukrainian capital Kiev. Skype is her main connection to her homeland of Crimea, where her family and friends have remained two years after Russia’s annexation of the region previously tied to Ukraine. They, too, face threats from the Russian government, she said. “Repression is spreading for local residents,” Andriyevskaya said. Russian President Vladimir Putin’s promised economic blossoming has not been realized, despite his government spending almost $3 billion annually to pay local salaries and pensions and to keep the economy of the former tourist destination afloat. As Russia begins its third year of rule, Crimeans say Western sanctions are the only thing exerting some pressure on Moscow. Meanwhile, renewal of the European Union’s sanctions in July hangs in the balance with Greece, Hungary and Italy, as well as officials in Germany, calling for them to be lifted. “The best way to describe what is happening in Crimea now is quiet repression. It’s sort of this black hole that’s incredibly difficult to monitor. There is very limited information coming from Crimea now,” said Yulia Horbunova, a researcher at Human Rights Watch focused on Ukraine who has faced difficulty in gaining access to Crimea, requiring permission from both the Russian and Ukrainian governments to travel there. With its sun-drenched beaches and warm climate on the shores of the Black Sea, Crimea was a popular vacation destination among both Russians and Ukrainians during and after the fall of the Soviet Union. The peninsula’s 2 million residents were largely dependent on tourism, welcoming 6 million people annually. After the Ukrainian Euromaidan revolution that ousted pro-Russian President Viktor Yanukovych in February 2014, so-called little green men appeared in the territory of Crimea as pro-Russian demonstrations were launched. At the time, Putin denied these masked men without any insignias were Russian soldiers. But after the troops captured key government buildings, a referendum on the status of Crimea was conducted March 16, 2014. In the internationally disputed election considered illegal in the West, residents were asked whether they wanted to join Russia. The official results indicated 96.77 percent of residents wanted to become a part of Russia in the hope that the region would be economically revitalized following more than two decades of neglect by the Ukrainian government. Two years after the annexation, Crimea has been integrated into the Russian Federation. Automobile license plates and passports all have been changed from the blue and yellow of the Ukrainian flag to the blue, red and white of the Russian flag that now flies above government buildings. And the annual number of tourists visiting the region has dropped by about 25 percent, to around 4.5 million. A native of Crimea, Andriyevskaya, 30, worked as a journalist for 10 years investigating local corruption, a topic that did not endear her to officials. She reported on the annexation and was added to a black list of journalists and activists who were not toeing the line of the new authorities. Fearing for her safety, she moved to Kiev in May 2014, but the psychological pressure did not end. Crimea’s new officials opened a criminal case against her, accusing her of inciting separatism. Russian federal security service agents raided her parents’ home in March 2015, questioning them about her work and playing her parents recordings of their private phone conversations. “I’ve lost the opportunity to go to Crimea and visit my parents,” Andriyevskaya said. Since the annexation, Crimean authorities have clamped down, banning gatherings in the city of Simferopol, closing media outlets and using the pretext of extremism or terrorism charges to arrest and intimidate people. The extrajudicial killings and torture committed by armed paramilitary groups and security officials that took place during and after the annexation have never been investigated. And the disappearances of seven people have never been probed, either. Activists have built networks in the region, working secretly with people who continue to live in Crimea and attorneys in Russia who agree to take on the cases. They declined to share their methods, to keep people safe. They noted they have gone so far as to urge supporters in Crimea to be careful of the things they like and repost on social media because agents of the Russian Federal Security Service, aka FSB, could be watching. “Crimea now has a serious and massive system of persecution: the FSB, the courts, the immigration services and others. The problem is if someone has pro-Ukrainian views, then they have no chance to defend themselves because the organs of power work under Putin’s position,” said Olga Skrypnyk, head of the Crimea Human Rights Group that works with locals to produce reports on the situation in Crimea. The Crimean Tatar population, a Muslim minority community, is also increasingly under pressure. In 1944, Soviet leader Joseph Stalin accused the Tatars of collaborating with the Nazis and ordered their mass deportation to Central Asia. Those who survived and their families were not allowed to return to Crimea until the late 1980s. The Tatar community of more than 200,000 was vocally opposed to the annexation and key Tatar leaders, Refat Chubarov and Mustafa Dzhemilev, have been banned from entering Crimea. Tatar media outlets, such as the independent channel ATR, have been shut down. Authorities are now attempting to clamp down on the group’s representative body, the Mejlis. “The authorities are trying to ban the Mejlis, which for 25 years has been in existence and represents the Crimean Tatar people,” said Alim Aliev, co-founder of the group Crimea SOS, which has been assisting people seeking to relocate from Crimea. While Crimean Tatars and pro-Ukrainians face a repressive atmosphere, increased pensions and salaries for people working in the public sector, such as the military, have made some residents of the region happy and supportive of Russia’s annexation, with images and posters of Putin widely displayed. “How do you interest people? It’s by finances,” said Liubov Kalmakova, a Crimean native whose pro-Ukrainian views forced her to move to Lviv in western Ukraine right after the annexation. Seeing little action by the Ukrainian government, Crimean Tatar activists launched an economic blockade of the peninsula in September and were purportedly involved in cutting off power that plunged nearly all of Crimea into darkness in November. The journalist Andriyevskaya said her parents, who live 40 miles outside Simferopol, still experience power outages, making Skype calls difficult to arrange. Russian and Ukrainian troops stand within view of one another along Crimea’s de facto northern border. Without a land link to mainland Russia, the Kremlin has undertaken the expensive task of building a $3 billion bridge to Crimea and is also constructing a $740 million energy bridge, with cables laid along the Kerch Strait. Putin visited Crimea Friday to inspect the bridge, threatening that somebody should be “hanged” in the event the project is not completed by Dec. 18, 2018. Plunging oil prices and Western sanctions imposed after the annexation hit the Russian economy hard. Basic financial services, including Western credit cards such as MasterCard and Visa, do not work on the peninsula, and Russia has had to import goods to keep shops full. Ukraine also cut off water supplies to the region. Aliev of Crimea SOS said his group’s hotline is now receiving more and more phone calls from Crimeans who want to leave because they cannot find jobs. In annexing Crimea, “Russia certainly underestimated the overall cost — the cost of sanctions, the cost of losing international contracts,” said Vladimir Dubrovskiy, a senior economist at the Center for Social and Economic Research, a Kiev-based think tank. While the EU called for more countries to impose sanctions Friday, its own unity is fraying, with leaders in Greece, Hungary and Italy, as well as Germany, hoping the economic penalties can soon be lifted. Hungary and Italy have argued sanctions should not automatically be renewed in July, and Germany’s Economic Affairs and Energy Minister Sigmar Gabriel said Thursday it was important for the EU to move to a position where sanctions could be lifted over the summer. “You cannot decide on sanctions by sweeping the issues under the carpet,” Hungary’s Foreign Affairs and Trade Minister Péter Szijjártó said. Activists are hoping European resolve will not melt away. They said that in the long run the sanctions will keep hurting the Russian economy and give the West leverage against the Kremlin, potentially making the cost of building a bridge to Crimea too great. “For us, it’s key that sanctions from our Western partners stay in place because we see their effectiveness,” said Aliev, the Crimean Tatar activist. “Sanctions aren’t something that have an effect immediately, but it’s the long perspective” that shows their worth. The annexation has divided families, with some staying in Crimea to safeguard their property and others moving to Ukraine, unwilling to take Russian passports. The Crimean native Kalmakova has settled into her new life in Lviv and said she likes the feel of the Old World European city, but that she would never be able to call it home. “I would like to return to Crimea or just see that Crimeans are safe, that people’s rights aren’t being violated,” Kalmakova said, choking back tears.